I really struggled with naming this post/recipe. Beernana Bread is perfect for a banana bread that’s made with beer – but for Search Engine Optimization purposes, I nearly shied away from the idea. I discussed it with my fella, pointing out that “Nobody is going to search for Beernana Bread; they will search for Banana Bread with Beer, or something.” But the true Dana, in all of her cleverness (cheesiness? ), had to have it her way. 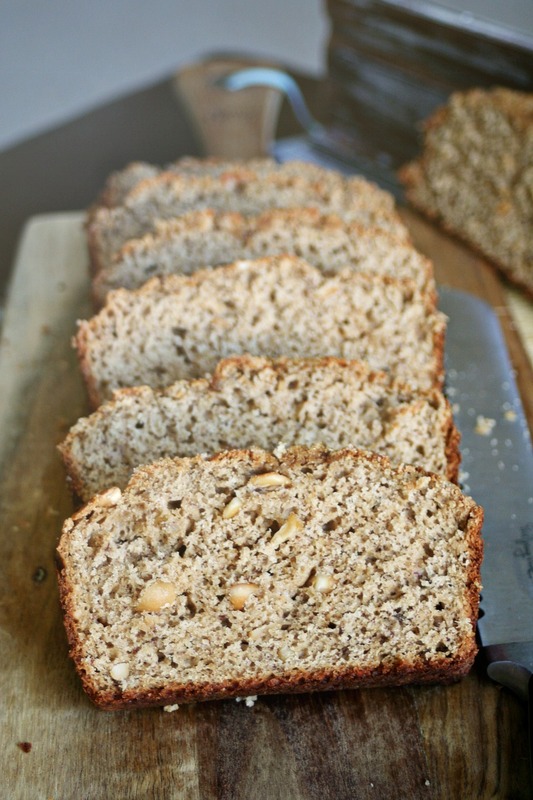 There was no chance that I could put this recipe up on my blog and not call it Beernana Bread. I often talk about how I dislike baking and how I’m pretty terrible at it. I don’t think it’s because I’m terrible so much as it is that I’m having a terrible time while I’m doing it – but yesterday was a game changer! This is, hands down, the best banana bread I’ve ever had. It’s super moist (why do people hate that word so much?) and the crumbled brown sugar and cinnamon topping will throw banana bread lovers into a state of rapture. 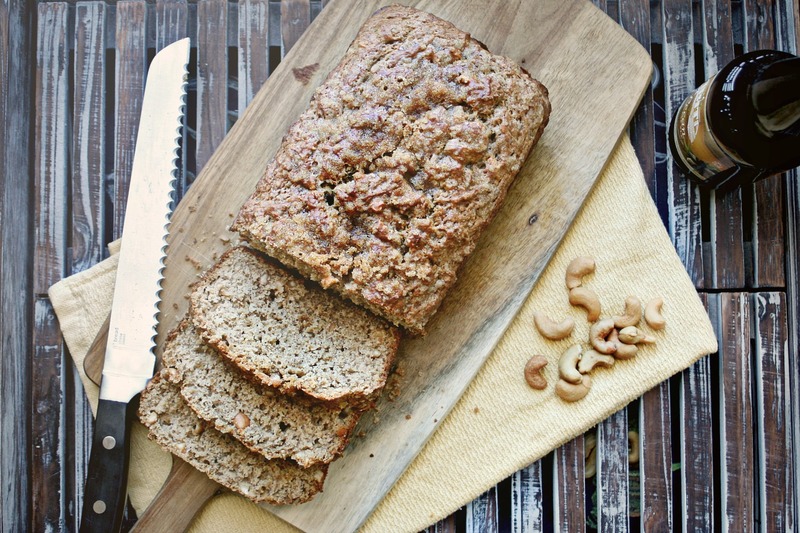 Another exciting twist – I used chopped cashews as opposed to chopped walnuts. You can totally use walnuts, or pecans, or any flipping nut you’d like – but cashews are a favorite of mine and I happened to have an entire jar of them in my pantry. So. My choice of beer was Abita’s seasonal Pecan Harvest Ale which is an amber ale. I’d be really interested to see if I could put a fun spin on this bread come summer time with Abita’s Purple Haze, which is a raspberry wheat (and one of my personal faves). A few banana bread recipes I researched that also incorporated beer into the mix baked at 350° F for 50-55 minutes. I baked mine for approx. 40-45 minutes. I like my baked goods moist and tender; almost raw (kidding). I fear baking to the point of “dry and brittle”. I had to high-five myself because the texture of this bread was on point. So, use your judgement while baking. I’d definitely pierce the loaf at approx. 40 minutes into baking and if your skewer comes out clean, take it out. And now, while you dream about Beernana Bread, I’m off to do house work. Preheat oven to 350° F with oven rack positioned in the middle. Lightly grease a bread pan with butter to ensure the bread doesn't stick. In a large bowl, whisk together the flour, sugar, baking soda, baking powder, salt, and cinnamon. In a different bowl, whisk the eggs until they are frothy. To the eggs, add the mashed bananas, melted butter, and finally, the beer. Mix well so there are no large chunks of banana left behind. Add the wet mix to the dry mix and stir well to combine, but don't over-mix. Fold in the cashews with a spatula; scrape the mixture into the greased bread pan. In a small bowl, mix together the ingredients for the crumbled topping. Evenly sprinkle the crumbled topping over the top of the bread mixture. Bake for approx. 40-45 minutes. Once done, allow to cool for approx. 30 minutes before taking it out of he bread pan. Once cooled, the bread should slide right out of the pan. Now is the beernana bread the single game changer for baking, or does the gas stove have something to do with it? Personally I'm a strong believer that baking should be done in a gas stove. Electric stoves have alot of temperature fluctuations that effectively alter the science of baking. Yes, baking is science... delicious delicious science.